I'll take a break from invented worlds on screen to one that is happening in the flesh now: the myth of The Rapture. 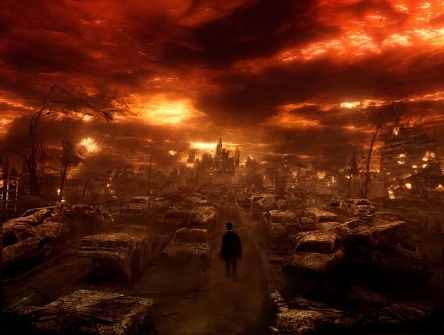 A Unitarian-Universalist like me, who disbelieves in Hell or Satan, who feels all faiths lead to the same destination though along different error-strewn paths, scratches his head at the invented world of The Rapture. But some folks believe 100,000 (or so) souls will be taken up tomorrow, and Twitter is abuzz with jokes. I asked William Gibson if he is "taken up," could I have the typewriter he used to compose Neuromancer? Pranksters in large cities are going to leave empty suits of clothing here and there on the sidewalks. My one Rapture Tweet: "You got Raptured and all I got was a lousy 1983 Chevy Cavalier." Even when I was a Catholic, I learned that this notion of Rapture is not only a Protestant "heresy" but also a recent one not based upon biblical ideas. The notion started in America. I won't belabor the point or even allow comments on this post. I'll just editorialize one point: whatever holy books (inspired by God, edited by humans) say, any god who would create a hell and then cast people into it is not worth worshiping. I do believe in a God of love, not an angry old man on a throne who would cherry-pick a few humans. Perhaps oblivion awaits the evil: that's a mystery to me. Enough Catholic teaching remains with me to be comfortable with the idea of Sacred Mystery. I believe that we were given this good Earth as a gift and it won't go up in fire and Tribulations unless we bring them down ourselves through poor stewardship. And if that occurs, I feel that God would be the first one to weep. So see you all on May 22, while the End-Times calculations get reset yet again. And we can get back to the cheerful nonsense of our daily lives. Update May 22, 2011: The sky did not roll back like a scroll as farmer Iggy (real Farmville, not the game) mowed a field and worked on the backhoe yesterday. The earth did not open beneath my wicked feet as I sipped a beer and listened to the whippoorwills at nightfall. No final trumpets sounded as I filled an old briar with "And Now to Bed" pipe tobacco, blended on the Isle of Jersey. I plan to go there one day. Midnight came and went, and those awaiting the Rapture had to recalibrate their Doomsday clocks. As my pipe smoke wafted up to the stars, so perfect beyond the light pollution of the cities, I gave quiet thanks, which is about all a Deist can do before a Creator who put matters into our hands. I gave thanks for this life, this world, and human ingenuity. As for human foolishness and the desire to live in special times? As for a not-so-subterranean wish to see others not like oneself suffer? I did not dwell on those things.